Living in a landed property has many advantages. As for people living in small flats, they are the first ones to realize that there is a big difference. It allows you to design and personalize, provides more space, and offers the chance to try the art of gardening and many more. In this post, we've compiled 6 beautiful, individual house projects. Explore these inspirational villa projects, and have an idea about which style appeals to you the most! Observe the neutral grille, which is designed to match the white facade. 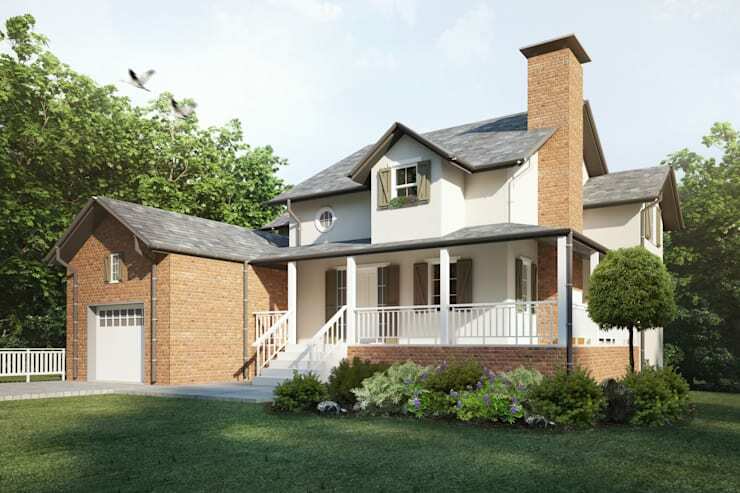 This house project offers one a warm and cozy atmosphere, without overlooking the modern elements that go together with the classical architectural elements. On the way to the entrance of the house, areas are covered with shades of gray, and natural stones and forms. In addition, the large lawn area can be reserved for a garden spot to achieve a spacious and fresh atmosphere. 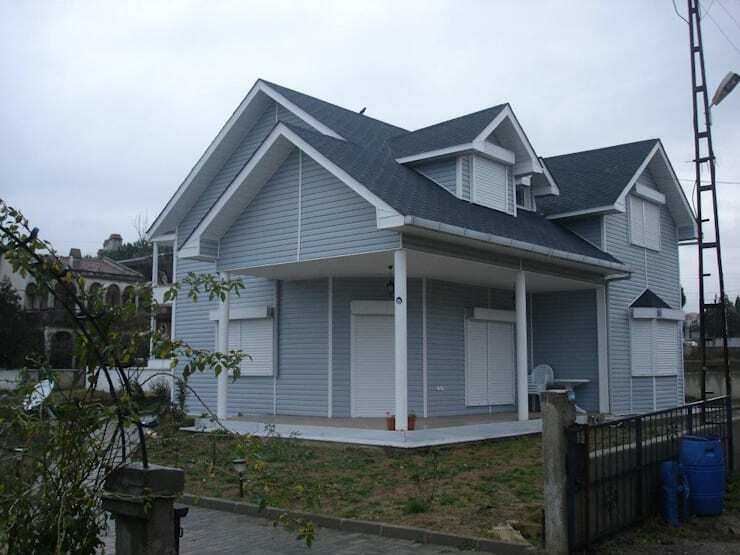 The roof model is preferred in gray tones compatible with the house front. This is a family house that offers comfort, at the same gives a modest appeal. 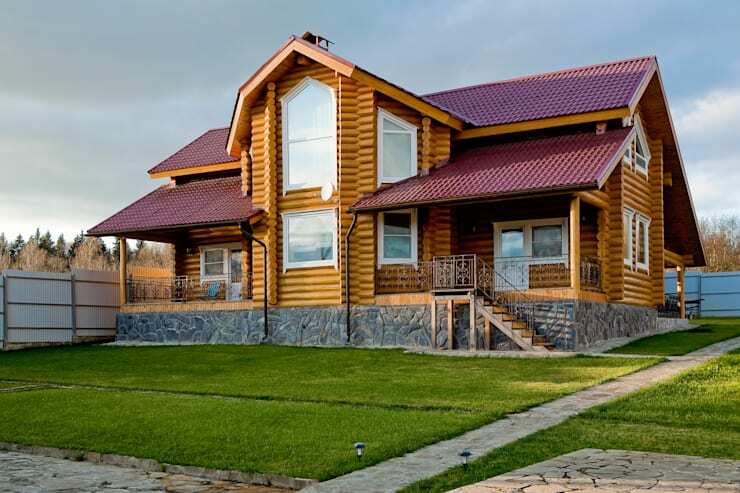 You can find dozens of different colors and texture alternatives for wooden houses, especially for facades; as well as combine natural textures with natural materials. In this case project, which is reflected in the facade architecture of the fireplace, spacious and open spaces are designed by means of wide windows that take the sunlight evenly. The roof forms of this project meet all the needs of the family, and the sub-level area is covered with natural stone flooring. 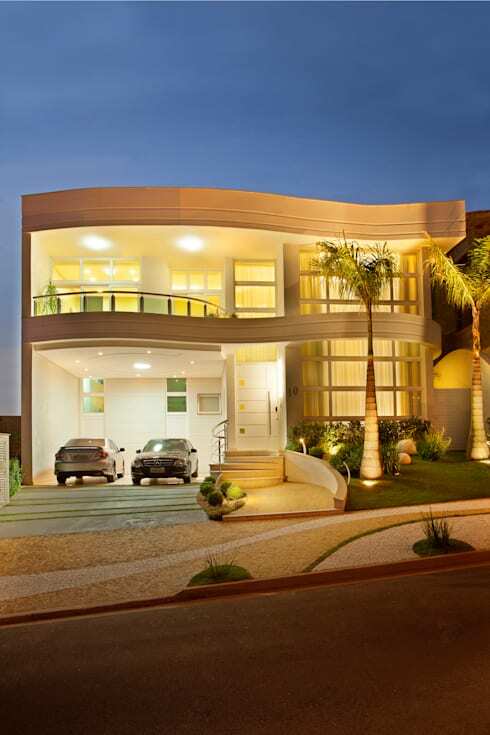 The modern villa, attracting attention with its radiant atmosphere, has two parking spaces. The stairway area and roads that traverse entrances are associated with each other and are provided with an aesthetic appearance with curves. You can also find the mobility of the forms in the façade architecture. A magnificent landscape architecture is applied from the garden area where palm trees are used. Interior windows are designed with uniform natural light and wide window openings. A frontage design with accurate and moderate lighting appeals to the eye. Wood is known for its classic architectural interpretation. In addition to the wooden houses that offer classical elegance, especially with the dreary and dark colors, there are projects that are sophisticated and lean lines stand out with modern solutions. This façade, which shows the magnificent harmony of neutral grays with white, is a collection of aesthetic elements bringing modern and classic together. 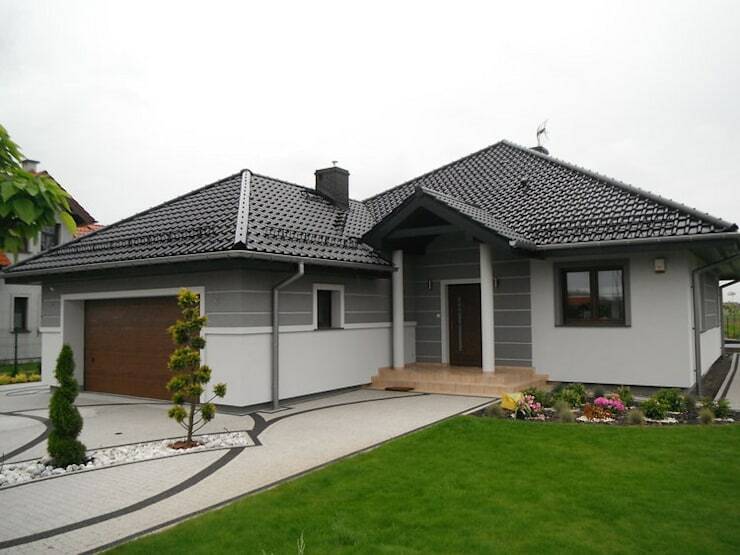 With the wooden ceiling in the garden and the color alternatives that make a difference, this beautiful home can be the one you are looking for. The project, which combines neutral gray and natural coffee tones with white elegance, has a spacious and stylish atmosphere. There is a contrast between the shutters on the house where the white is dominant on the veil, and the architecture that appeals from the forefront. There is also an excellent garden area with a garage-parking space. It is a dream-like home for those who wish to be in harmony with nature. You can also find projects in many different styles designed by landscape architects here at homify; get inspiring ideas! Drawing attention with its facade architecture and modern lines, this villa offers many people the possibility to decorate and be hands on with their dreams. This project is designed especially with aesthetic and functional elements that can easily meet the needs of a family. 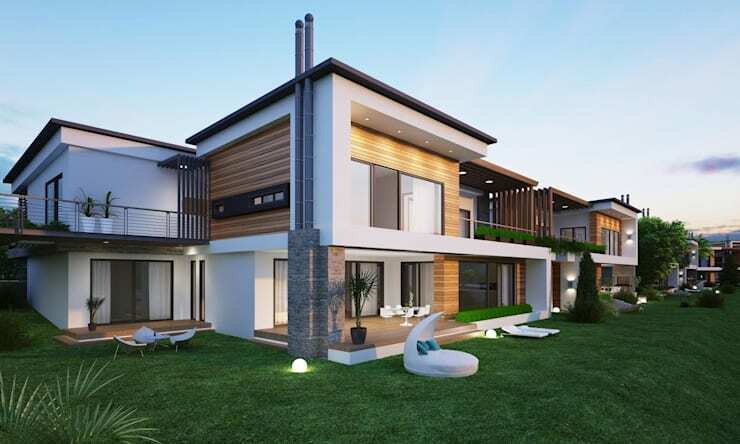 The villas in the facade architecture, where the simplicity of white is met by the warmth of wood, stand out with its aesthetic foreground that comes out with the lighting that brings out the natural textures on the frontage. The peaceful atmosphere and lush garden will give you a refreshing feeling. If you like this post, you can also check out our article about a wooden house that radiates style and comfort!